Smart Allergy Friendly Education: Rich Whip - A Non-Dairy/Gluten free Whipped Cream Option for your Holiday Weekend Dessert! Rich Whip - A Non-Dairy/Gluten free Whipped Cream Option for your Holiday Weekend Dessert! With the holiday weekend quickly upon us, many of us are getting ready to enjoy some of our favorite desserts. Sadly, whipped topping is a delight many with allergies can't enjoy! As an apple pie and whipped cream lover, I think I may have some good news for you! This milk-free, egg-free, nut-free household adores the following suggestion. 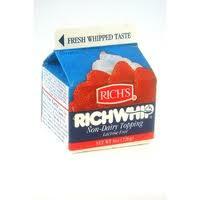 Rich's RICHWHIP Non-Dairy Topping, distributed by Rich Products Corporation, Buffalo, NY. The ingredients include: WATER, HIGH FRUCTOSE CORN SYRUP, PARTIALLY HYDROGENATED COCONUT OIL, PARTIALLY HYDROGENATED PALM KERNEL OIL, CONTAINS LESS THAN 2% OF THE FOLLOWING: CARBOHYDRATE GUM, SUGAR, POLYSORBATE 60, POLYGLYCEROL ESTERS OF FATTY ACIDS, SALT SODIUM AGINATE, SOY LECITHIN, ARTIFICIAL FLAVOR, SODIUM CITRATE, NATURAL FLAVOR, COLERED TURMERIC AND ANNATO EXTRACTS. It also states the following on the packaging: Lactose Free. Their website states that this product is also: 100% milk free, gluten free, vegan (no animal-derived ingredients) and Kosher pareve. For more information, contact: Rich Whip or 1-888-732-7251. Word of warning... you will need to whip it for the full 8 - 12 minutes. Now would be a good time to purchase that electric stand mixer if you haven't already done so! It truly does form soft peaks, has a light texture and tastes delicious. I used this exact ingredient to make the Ghosts In The Graveyard baking project at school and one of the kids who doesn't like ANY regular whipped cream, LOVED this stuff. Where can you find it? Look in one of your national food chain stores. If your grocery store has a kosher freezer section, check there first. That will be your best bet. On their webpage you can type in your zip code and it will tell you where you can find their products. Just be forewarned, it may tell you the product isn't available in your area when it is. That is the case for where I live and I have found it many stores! Now go out and show one of your whipped cream deprived loved ones a bit of what they've been missing!